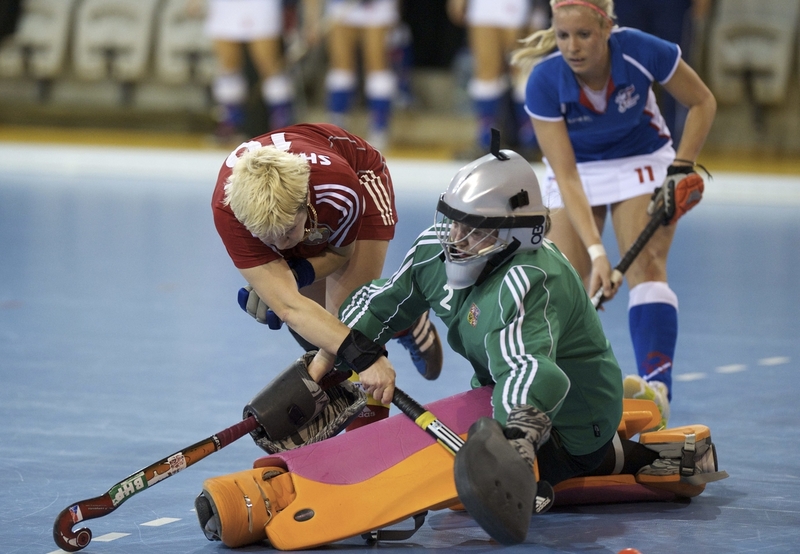 The second day of the EuroHockey Indoor Championships was also full of surprises! The opening game was filled with high drama as France went ahead and were playing very well, but Belarus were always at the heels and whilst France were ahead for the whole game, Belarus played most of the second half without their keeper, and kept clawing back the scores. Their pressing paid off in the end as they scored twice at the end of the game to secure the draw and a vital point. A fairly staid game with neithe team creating chances, but the result was enough for both to make the semi-finals, so there wasn’t much impetus towards the end of the game. A much improved performance from England with Sophie Bray bagging a hat trick and the Germans had to work hard for their win, they would have to wait for the final game in their pool to see their placing. The hosts once again had a partisan crowd fully behind them in the remarkable performance against the Dutch. Adela Bizova was lethal with her drag flicks and Czech were 2 up within 5 minutes. They got to 4 without reply before the Dutch found their form and a late goal from Denise Admiraal sealed their top slot in Pool A and the Czechs enjoyed their moment of glory beating The Netherlands at home. During the break we were treated to a demonstration game of Electric Wheelchair Hockey, The New Caviliers v The Jaguars. The sport which is played in more than 10 countries over 2 Continents has International, World and European Championships. It started in The Netherlands in the 70’s but is only played in Czech Republic since 2002. There are 5 clubs in Czech Republic playing EWH. Following the game, the Tournament Director, Edna Rutten and the President of Czech Hockey, Gino Schilders presented the 2 captains, players and officials with gifts from the EHF to thank them for taking the time to show us their sport and particpate in the EuroHockey Indoor Championships. Englans secured 3 points and the possibility of a World Cup place next year with a 3-0 win over France, who were possibly still recovering from the emotional roller coaster of their earlier game v Belarus. A cracking game of indoor hockey was played in front of a very decent crowd of about 600. The draw and single point each, means that all teams in the D, Relegation Pool have the possibility of staying in the Championship division for 2016 and also taking the 2 slots available for the World Cup. Tomorrow’s games therefore are all crucial. The score was by no means a reflection of the game, as the play was much closer than the ultimate 4 goal advantage of the Germans. There is a rumour around that the German’s only ever lose one game in a Tournament, and so far that would be true here in Prague, their loss to the Netherlands yesterday seems to have pushed the girls on and it was a solid performance that won them this game. The final game of the day was certainly the match of the day! Netherlands came out of the blocks quicker than Poland a scored in the 3rd minute, but Poland scored 2 before the half and led 2-1 going into the break. The second half was a stunning game of hockey with end to end entertainment and both keepers being called upon to make big saves, especially the Polish keeper Dominika NOWICKA played a stormer. The final result was 2-2 and it took a shoot out to separate the teams, The Netherlands just poking in front with one goal from 3 shoot outs, whilst Poland failed to score from theirs. The type of game that it seems a shame to have a winner! But we needed that, and the Dutch girls now face Germany again and will be hoping to prove that rumour to be false! NextNetherlands are European Indoor Champions for the first time!